Whether they actually met Pope John Paul II or personally witnessed him speaking or leading a mass, local people described the late pontiff as awe-filled and seeing him as "awesome." Father Richard Leisen, of St. Louis Catholic Church, actually met the late Pope while on sabbatical in Rome in 1985. Leisen described the Pope as charismatic and said it was "awesome" just to be in his presence. While spending several months near Rome and after having the opportunity to be part of several public viewings, Leisen was invited for a private mass with the Pope along with 29 other priests from around the world in 1985. Just to be in the Holy Father's presence was wonderful, said Leisen. 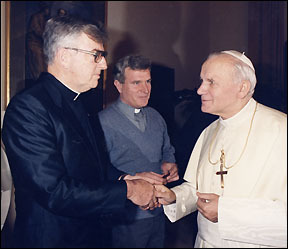 Father Richard Leisen met Pope John Paul II during a private audience at the Vatican in 1985. Leisen, the priest at St. Louis Catholic Church, described the late pontiff as caring, warm, inspiring, and charismatic. After mass, Leisen got to speak with the Pope, who asked about his work with Catholic Relief. Though Leisen knew the Pope had been briefed about each of the priests' roles in the church, it felt like he took a personal interest in Leisen's work. Even from afar, local people who either took pilgrimages to the Vatican for public masses or who saw the Pope during a visit to the United States echoed the same sentiment: just to be in Pope John Paul II's presence was awesome. "It was exciting just to be there," said Rosemary Dilley, of Paynes-ville, who joined thousands of people to see the Pope in 1979 when he visited Iowa and addressed a group of people, mostly farmers, at a farm museum near Des Moines. Dilley compared the experience to the Bible story where Jesus fed a multitude of followers with just a few fish and several loaves of bread. So many people were taking communion during the service in Iowa, said Dilley, that the bread and wine seemed to appear out of nowhere, the supply never ending. Virgil and Jane Lenzmeier of Lake Henry also saw the supreme pontiff in Iowa in 1979. "You're in such awe," said Jane of being in the crowd. Standing on a hillside with thousands of other people, the Lenzmeiers felt they were part of something holy. Though she remembers the reign of other popes, John Paul II left the most profound image as a leader for Jane because he reached out to common, everyday people. She believed he honestly cared about people. "He brought a lot to the faith all over the world," said Jane. Especially to those who were hurt by war, she added. "He went through so much growing up he could sympathize with war-torn people," Jane said. Born in communist Poland in 1920, Pope John Paul II had firsthand knowledge of war and hardship, and he was a strong voice for peace up until his death. In fact, he was opposed to the war in Iraq, said Leisen. "The Pope thought the U.S. should not go to war, but to bring peace through non-violent ways." said Leisen. "He was always the man reaching out to bring the peace," Leisen continued. "He appealed to the level-headed," said Father Leo. Leisen of St. Margaret's Catholic Church in Lake Henry, St Agnes in Roscoe, and St. Michael's in Spring Hill. "Not everyone listened to him. If we did, the world would have been a better place," he said. Though Father Leo never met the pontiff, he will remember the Pope as a leader who belonged to everyone - Catholics and non-Catholics alike - since he was the first pontiff to reach out to Muslims and Jews and to work for peace in Israel. "He was amazing in his humbleness and his inclusiveness," agreed Laura Thompson, who saw the Pope in New Orleans in 1987. "He reached out to all people, regardless of their beliefs," said Thompson. Though she wasn't a Catholic, Thompson felt "the presence of being part of something very holy." Thompson believes Christianity is universal and that people didn't need to share the Pope's beliefs to understand his greatness. A focus of the Pope's mission was to connect with youth, and he reached out to them. In 1993, the pontiff spoke at a youth rally in Denver, attended by thousands of teens and young adults, including two busloads of youth from churches in the Paynesville area. Loretta Thomas of Paynesville, who accompanied her granddaughter to that rally, thought it was nice that youth were ushered to the front of the crowd so they could be closer to the Pope, while adults were relegated to the back of the crowd. Though she wasn't able to get close to the Pope for mass or communion, it was still a beautiful trip, said Thomas. "It's the nicest trip I've ever been on," she reported. Angela Mehr, who lives near St. Martin, went to the Denver rally with a group of youth from St. Margaret's. It was exciting to know that she was taking part in a historic event, she said. Pope John Paul II is the only pope Mehr can really remember. She hopes the new pontiff will carry on the work that John Paul II started. "Whoever replaces him will have very large shoes to fill," agreed Karen Bachman of Paynesville, who attended a public mass with the Pope at the Vatican in 2003. While the audience was packed in St. Peter's Square and a nearby auditorium (where the crowd was ushered when it started raining) and the Pope spoke in a language she couldn't understand, Bachman still felt the awesomeness of the Pope's presence as he blessed the masses. The next pope will be elected by a group of 117 cardinals within the next couple of weeks. Jane Lenzmeier believes that God will guide the cardinals to elect the right person to lead the Catholic Church. "The last one was an unknown guy from Poland. Whatever the spirit moves (the cardinals) to do should be the right thing," she predicted.